Springbank, Alberta - Canadian performance trainer, Clay Webster is sharing what he loves best to help a cause that is close to his heart. In 1995, Webster lost his mother, Faye, to leukemia. Now the horseman dedicates himself to a number of charity benefit demonstrations each year, to help raise money for a cure. Starting at 7:30 pm on November 29, 2002, Kestrel Ridge Farm in Springbank, AB and Clay Webster Performance Horses Inc. will host a Canadian Cancer Society horse demonstration. All equine enthusiasts are invited to learn about Webster's GENTLE LOGIC© training program and watch as he applies the system to various horses. There will be no admission fee, however, donations will be encouraged. All proceeds will be donated back to the Canadian Cancer Society. The session will cover a variety of horse related topics including, the progression of foundation ground work to performance in the reining show pen, body control, health issues and questions about problem horses, etc. This proven competitor, proven clinician has worked with over 1,500 horses of various breeds and disciplines and instructed hundreds of riders through lessons and clinics. Webster's own GENTLE LOGIC© program was derived from the inspiration of some of the world's most prominent trainers, clinics and lessons, formal education, apprenticeships, books and videos, and numerous years of experience in the horse industry. His recent accomplishments include the National Reining Horse Association Open Reserve Championship at the 2002 Blacklandslide, the Novice Horse Open Championship and Reserve Championship at the 2002 Okanagan Summer Slide, the NRHA Ltd. Open Championship at the 2002 Reining Alberta Spring Classic, the 4 & 5- Year-Old Ltd. Open Derby Championship at the 2002 Saamis Summer Slide, and the Ltd.
Open Reserve Championship at the 2001 Canadian Supreme. 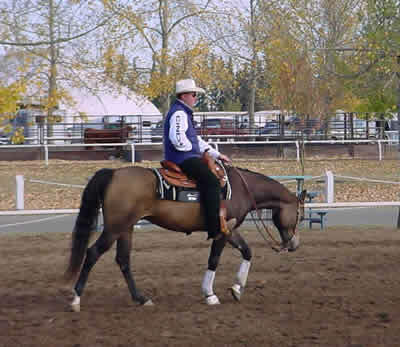 Webster was also awarded the number two standing in all of Canada for the 2001 Reining Canada Top Ten Limited Open Division, and the Reining Canada Provincial Limited Open Reserve Championship for the year 2001. For more information, please contact Randy Moat at Kestrel Ridge Farm at (403) 242-9110. Or check out the Kestrel Ridge website for directions and examples of concepts that may be covered www.kestrelridgefarm.com. Clay Webster's website can also be found at www.northernhorsereview.com/we We hope to see you there!